La Ventana is a fusion vessel specially designed with custom-made inserts for creating personalized food art within a special container. Since the visual scale forms an important part of the scope, the food arrangements inside the transparent vessel are further emphasized by a special 32 inch LED ring system. 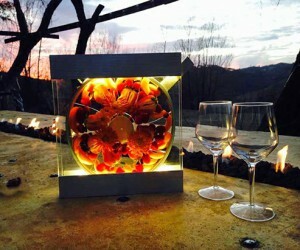 It illumines the entire window making La Ventana a fascinating dining table centerpiece that will astonish every guest.